The sodium mineral, also known as salt, continues to receive a great deal of attention, much of it on the negative side. 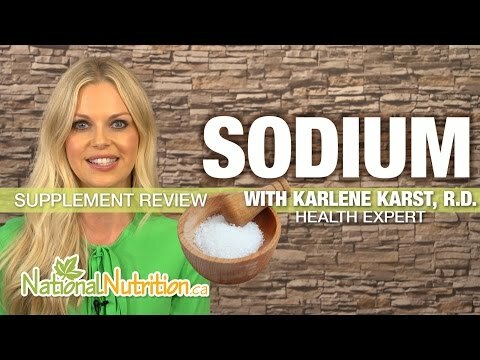 Nevertheless, no matter which way that you look at sodium, it is still considered a key nutrient and is extremely important that the human body gets it's quota each day in order for it to function properly. While the fact remains that too much salt can lead to a greater chance of heart disease, stroke and high blood pressure, the development of kidney stones as well as other conditions, the human body needs at least one hundred milligrams each day in order to function properly. Having said that, it is also a fact that the majority of folks consume considerably more sodium than is good for their own health and well-being. Sodium is an electrolyte, which means that, in conjunction with chloride and potassium, it helps regulate the electrical charges that take place amongst body cells. These types of electrical charges are used by cells to communicate with each other and are also what provide our five senses with the capability to hear, see, smell, taste and touch. In the region of thirty percent of the sodium mineral within the human body is stored in the bones with the balance being found in bodily fluids. Sodium is a primary element of blood plasma and close to sixty percent is contained within the fluids, which surround cells. Approximately ten percent of the body's sodium is stored within the body cells. This distribution helps keep a correct balance of water inside as well as outside these body cells. The presence of sodium within the circulatory system helps the body maintain blood pressure levels as well as the overall blood flow volume within normal ranges. Sodium also helps prevent the blood from clotting, which can be an extremely dangerous situation. Within the blood stream, sodium in conjunction with potassium assists in maintaining the blood's delicate pH balance. Sodium also helps carry essential nutrients to the body cells. Within the digestive system, sodium helps in the process of metabolizing foods into energy while also protecting the lining of the stomach by preventing the acids within the stomach from burning it. Significant levels of sodium can be found in the majority of processed and preserved foodstuffs. Potato crisps and pretzels, hotdogs, ham and bacon, tomato salsas, ketchup, luncheon meats as well as canned soups are prime examples. Reduced amounts of sodium also occur naturally in numerous foods such as various meats, poultry, eggs, nut products, fish and shellfish, carrots, beets, artichokes, cauliflower, celery and even dairy products. Given that countless food items that we consume already contain salt, it is not necessary to add even more before eating. The human body will lose sodium every day. It escapes the body through the urine as well as through sweating, which explains why a large amount is lost on warm days and following any strenuous workout session. Given that so many food products contain salt, sodium deficiency is uncommon. Nevertheless, a significant loss of sodium can result from excessive nausea or vomiting and/or diarrhea. Diuretics, including those that are prescribed by doctors to help reduce high blood pressure, can also diminish sodium levels. Symptoms of a sodium mineral deficiency that is combined with a loss of water typically include muscle cramping and weakness, light-headedness, an inability to focus, memory impairment and queasiness. In the event the deficiency becomes severe, the blood circulation system can collapse and the entire body could go into shock. A deficiency in sodium by itself can allow water to penetrate the cells resulting in the cells becoming inflamed. A consequence of that occurring is water intoxication, the symptoms of which include anorexia, apathy, lethargy and muscle twitching.